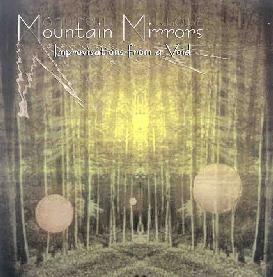 Mountain Mirrors - "Improvisations From A Void"
Eclectic music for spiritualists, stoners, thruth-seekers, lovers and sinners... What more can you say? This is a solo music project by Jeffery Sanders from Massachussetts. It is a collection of self produced 4 track recordings using drum machine, guitar, vocals, bass, synth and some additional drums and percussion. "The Chimes" is a very eerie track of just drums, bass and voices, then goes into a very cool ethnic inspired rock track called "Sidewinder". Jeffery really comes up with some cool bass sounds on many of the songs. Quite a lot of chaos thrown in with the varied tracks here. "Satori" is a short acoustic guitar piece, while "Inside The Drum" is a funky spaced out number. The CD was a very interesting listening experience. Hear music samples at the Mountain Mirrors Mp3.com web site at: http://www.mp3.com/mountain_mirrors. Contact via snail mail c/o Jeffrey J. Sanders; PO Box 884; Mattapoisett, MA 02739.